Dr. S.V. Sanford, the Southern Conference commissioner. 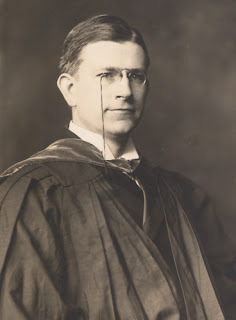 In 1912, Dr. George Hutcheson Denny was named president of the University of Alabama. The 42-year-old former head of Washington & Lee arrived in Tuscaloosa with a specific plan to use the sport of football to help the school grow. From the very start of his administration, Denny, who was commonly referred to as "Mike," took a direct hand in developing the football program, recognizing its potential as a way to increase enrollment as well as gain political and popular support for his policies. Dr. Denny at Washington & Lee. He placed the football program under the direct budgetary and administrative control of the university’s athletic department. He oversaw the hiring of coaches and supervising practices from the sidelines. In the latter capacity Denny was regularly knocked over by players and the team develops a superstition develops on the team that "bowling over" the UA president is good luck for bowl games. 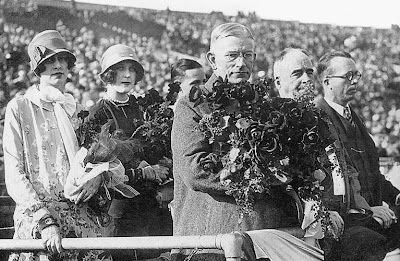 During his tenure, the Crimson Tide appeared in four Rose Bowl games and he was an attendance at the first three of them. In 1935 Denny was unable to travel to Pasadena due to an illness that led him to retire two years later. He became president once again in 1941 after the death of his successor Richard C. Foster. He stepped down a final time in1942 when Raymon Ross Paty was named president. Known for his wire rimmed glasses and pipe, Denny was reported to possess a prodigious memory and it was said he never forgot the name of any person he met. Denny died on April 2, 1955 at his home in Lexington, Virginia where he is buried. The first permanent home for Alabama football was University Field which opened in 1915. It was renamed Denny Field in honor of the university president. 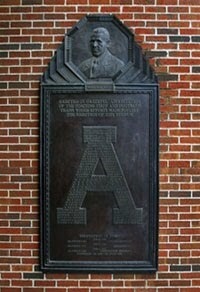 When the first section of the team's stadium was built in 1929 it also was named in honor of Denny and it retains the designation to this day.